Up and on our way at 10 a.m. for Durango to see the rodeo. 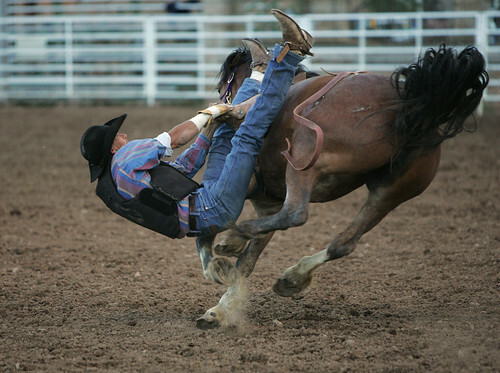 We arrive early so have lunch at Arby's, then go to the fairgrounds rodeo arena where we see 2-1/2 hours of rodeo. A couple of things we hadn't seen before: under 6 year-olds bronc riding sheep. So cute! Then square dancing on horseback. Real good! Back at Fairfield Pagosa Springs we played shuffleboard. Frank won 2 out of 3. We come back to the condo and sit in the jacuzzi. We watch a little TV, then go to dinner at Dorothy's in Pagosa Springs. So so. We return to Fairfield's lounge where a western singer is performing. We stay 1 hour. I drink 1/2 of a white russian. It makes me feel warm and breathless. I don't feel well. I can't drink alcohol anymore. The Durango Fiesta Days is celebrating its 77th year this summer. Mom always loved horses and would take my brother and I riding when we were little. I can see where she would enjoy the rodeo. When we were there last year, the Fairfield resort didn't have a lounge, just a reception area and a sales area where a representative twisted our arms for 3 hours to try to get us to buy more timeshares. How I hate those things, but my husband will do almost anything to get a free $50 American Express card! I would have rather spent the 3 hours at the rodeo.